Music for Wilderness Lake. Courtesy Make Music New York, Inc. The environmental music piece Music for Wilderness Lake was written 35 years ago by Canadian composer R. Murray Schafer. It's a work for twelve trombones with accompaniment by the wildlife that happens to be in the environment. 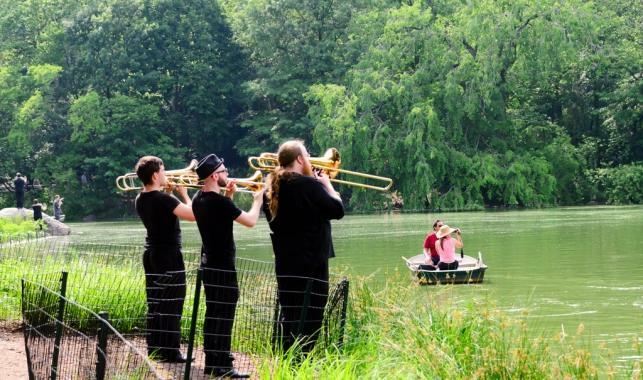 Music for Wilderness Lake has traditionally been performed by a dozen trombonists arranged around a body of water, signaled by a director on a dock or in a boat. In the case of this Austin performance, the signaling will be done from a handmade canoe built by Austin woodworker Aldo Valdés Böhm. The performance is in two parts, one at dusk (which should be around 8:15) on Friday night and one at dawn (or around 6:30) on Saturday morning. The experience of the music will vary depending on where one stands and on how loud the local birds and bullfrogs decide to be. It's produced by the Contemporary Austin and will be performed at their Laguna Gloria location. It's free and open to the public. Hear Music for Wilderness Lake at Laguna Gloria. 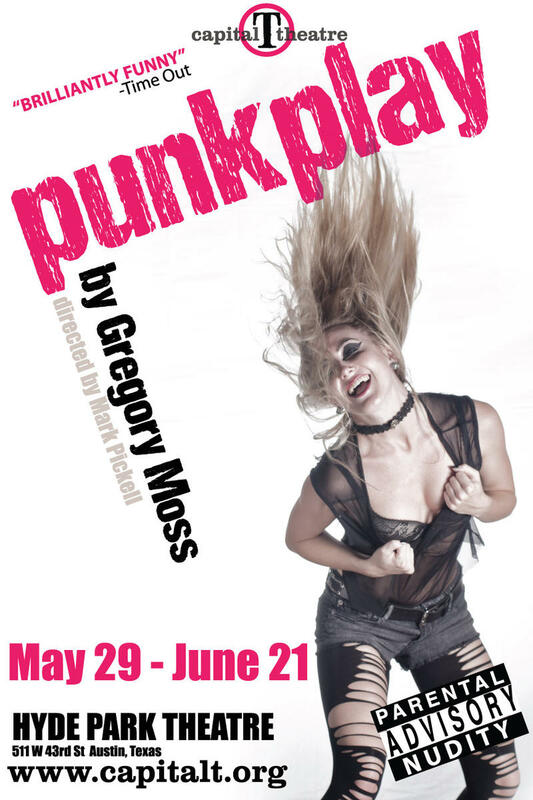 If you're looking for a play with live music, live animals, and a healthy dose of '80s nostalgia, punkplay might be the show for you. The coming-of-age tale is set in the American suburbia of thirty years ago, in the age the cold war, Ronald Reagan, and punk rock. The play (by Gregory Moss) centers around two teenage boys, Mickey, a disaffected high school student, and Duck, an angry young runaway who befriends him. Their lives and relationship are changed by their exposure to a vinyl punk record. 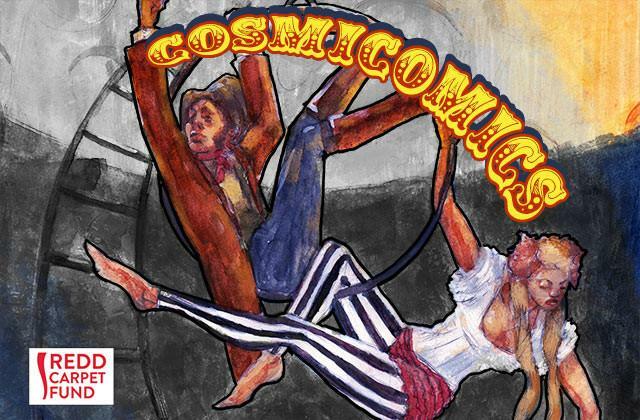 Cosmicomics is the latest aerial show from the folks at Sky Candy. Produced in collaboration with writer/director Rudy Ramirez, it's an acrobatic theater version of the much-loved short story collection of the same name by Italian author Italo Calvino. The stories, first published in 1965, each begin with a scientific fact or theory and from there spin a fantastical yarn based upon it. In Calvino's world, humans used to jump to the moon to gather cheese and pasta is the reason for human existence. The Silence of the Lambs won a ton of awards after its 1991 theatrical release, including five Oscars. But there will still some who felt the story would have been better served if it included a little more singing and dancing. And those people are finally in luck, because they can now enjoy a version of the crime drama that doesn't skimp when it comes to lavish musical numbers. Silence! 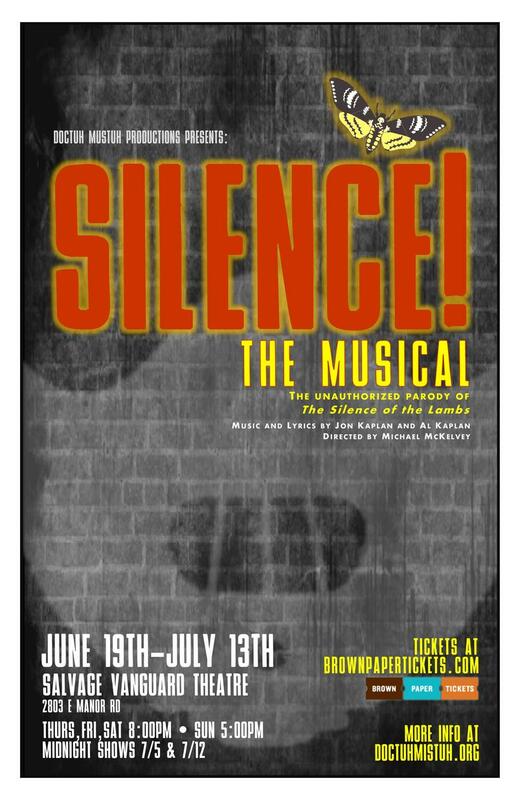 The Musical is an unauthorized parody of The Silence of the Lambs; it started life as an internet musical in 2003 and was so popular online that it was eventually expanded into a full length show that debuted Off Broadway in 2011. Like the original movie version of the story, Silence! was well-received by critics and won a handful of awards.